Last year we wrote about the logistics of globalization, examining the challenges that 3PL providers face whether goods from the next state over, or a country on the other side of the world. That proved to be one of our more popular posts, so we thought we’d see what things look like almost a year on. Rather than delve into any one topic (which we’ll probably end up doing in several future posts anyway! ), though, here’s a look at global logistics through the lens of statistics. 4. Container ships seem to get larger every year. The biggest container vessel currently sailing the seas can hold a whopping 18,000 TEU [Source: BBC, 2013]. Contrast that with statistic number 3 and multiply it by hundreds of bustling ports in countries across the globe. That’s a lot of cargo on the move on any one day! Which stats strike you as the most representative of global economic expansion and logistics globalization? 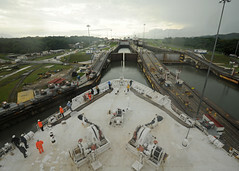 We wrote last year about the important ongoing expansion work being done on the Panama Canal. Well it goes on no longer, for the moment at least, as a labor dispute worth a mammoth $1.6 billion halts operations. As with most labor disputes the truth behind the latest Panama Canal strike probably lies somewhere in the middle, but that’s of no comfort to the many global businesses counting on a project that is running over on many counts. Checking the other box true of most projects, the expansion is already expected to run over its previous deadline of August this year. This would have seen the Panama Canal celebrate its centenary – the first navigation of the waterway was on August 15th, 1914 – in fine style, but work isn’t now expected to be completed until some time in 2015. Any extended delay now risks pushing the project into a second year of delay, not something acceptable for a channel that the ASCE describes as one of the seven wonders of the modern world. Though happening thousand miles away, the disruption isn’t something that tri-state area businesses can ignore. The route is a vital one for global trade, affecting goods both in and out of the United States to the tune of hundreds of millions of dollars. The expansion will allow passage for vessels carrying more than 2.5 times the current maximum capacity, bringing down supply chain costs for import and export businesses alike. And historically-speaking we have even deeper reason to take an interest locally. The supervision and completion of the Panama Canal was under the control of none other than George Washington Goethals, the very same man for whom the bridge connecting Staten Island, NY to New Jersey is named. Goethals has a storied place in U.S. history, both engineering and military, so it’s just one more item to add to the laundry list of reasons hoping that one of the world’s most important waterways gets its act together, before the project sails into more dangerous waters.